While I have reviewed many audio dramas from AudioGo in the past, this is the first time I’ve ever reviewed a audiobook. Sure, I’ve reviewed audio drama/audiobook hybrids before, but this is new territory for me. And you know what? I liked it. I still prefer audio dramas, but this was a fun change of pace. Back when this collection of 6 unabridged stories was originally issued as an audio cassette release, it was a Tangled Web Audio release called Hauntings: A Classic Collection. Later it was released by BBC Audio under the name Great Classic Hauntings. In keeping with the change, a new (but brief) introduction was recorded to reflect the title. However, the narrator for that segment is not the same as the narrator for the stories themselves, Geraint Wyn Davies. Readers of this site might remember him from Forever Knight or Cube 2: Hypercube. Davies is an excellent narrator, whose voice is serious and offers an almost factual tone to the various tales of terror. He also acts appropriately excited at times and his “lapsing” into his accent is a great touch when he portrays certain characters. Although he adopts a distinctive voice for each character, the effect is nothing like an audio drama. Davies also wisely avoids using a falsetto when portraying female characters, as such an unintentionally comedic effect would clash with the theme of the collection. Without any backing music, his voice is given the stage it needs to completely entrance the listener, which helps with the illusion that someone is really reading a story to you. 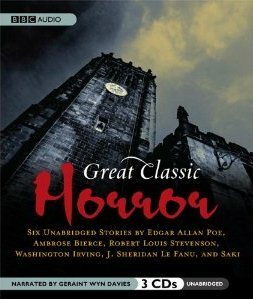 AudioGo has chosen a fine selection of stories from classic horror authors and interestingly opts not to go with some of the more famous stories by certain authors. For example, Irving’s “The Legend of Sleepy Hollow” could have easily fit into this collection, but the use of his more obscure ghost story made for a much more exciting and mysterious time. Speaking of which, the complete running time is 2 hours and 40 minutes, with two stories being contained on each of the 3 discs (which are enclosed in a 3 panel cardboard slipcase held in a cardboard box). Not only is this collection a great way to entertain one’s self on long trips, but it also offers some interesting potential for your next Halloween party. Telling ghost stories is a time-honored tradition at such events, so why not play material from Great Classic Horror to enthrall your guests? I recommend going a step further and creating a “storyteller” figure to add to the effect. You can use tutorials like these two to show how to give your storyteller a moving mouth that is synchronized with the audio or you can opt for a dummy using an “Invisible Ghoul” mask if you don’t want to bother with electronics. That said, including glowing eyes such as the ones from this variant of the “Invisible Ghoul” concept would make a great touch.